Every animal lover knows that dogs belong in loving homes. They are not disposable tools for students to practise on. 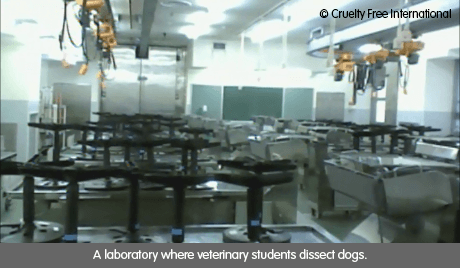 Our investigation has made the shocking discovery that in Japan, hundreds of dogs are used every year by veterinary schools to train students. We have made the heart-breaking discovery that dogs are subjected to multiple unnecessary surgeries – repeatedly cut open and stitched up. When no longer needed, many of the dogs are killed, and most end up being used for dissection. At one university, the dogs were kept in appalling conditions, confined alone in small metal cages. Each dog had only enough space to stand up and turn around, circling inside their small prisons. This cruel and unnecessary practice has been abandoned by many universities and veterinary medical schools throughout the world, including UK, Canada and the USA. There are many humane alternatives to train veterinarians, including simulations, models and real animal patients in a clinical setting. Please sign our petition to end the horrifying use of dogs for surgery practice in Japan. Please sign the petition to the Japanese Embassy urging them to end the use of live dogs for clinical and surgery practice in Japan. If you would like to receive email updates on our campaigns, appeals and news, please tick here.